MOVIE REVIEW: Beverly Hills Chihuahua: Kids’ Flick Is Smart Enough For Parents to Enjoy! You’ve probably seen the trailers with the ancient Aztec ruins and the Esther Williams-like production number performed by Chihuahuas. The movie lacks the production number but the ruins play a crucial part in the proceedings. 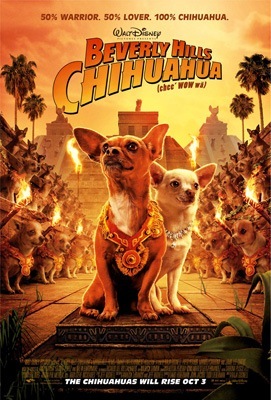 What’s really surprising is that Beverly Hills Chihuahua is a kids’ flick that will entertain the kids but has some gags that will work only for the parents. Chloe [voiced by Drew Barrymore] is the queen of the Beverly Hills canine scene. Spoiled rotten by her owner, Vivian [Jamie Lee Curtis], Chloe is shallow, selfish and haughty – not to mention rude to Papi [George Lopez], the landscaper’s Chihuahua who loves her. That all changes when Vivian heads off to Europe for ten days, leaving Chloe in the irresponsible hands of her niece, Rachel [Piper Perabo] – who heads off to Mexico to party, dragging Chloe along. More concerned about partying and meeting guys, Rachel lets Chloe get away from her and the poor thing is dognapped for a floating illegal dogfight enterprise. Because this is a Disney film, the dogfight never happens as Delgado [Andy Garcia], a noble German Shepherd, rescues her just before her opponent, a vicious Doberman named Diablo [Edward James Olmos] can rip her to shreds. The rest of the film is the story of Chloe and her new friend try to get her home – all the while Rachel, Papi and his owner, Sam [Manolo Cordona] are looking for them. Director Raja Gosnell [Mrs. Doubtfire, Nine Months] keeps the pace up, giving the film the feel of a romantic farce. The voice cast is extremely good [big names are joined by animation veterans like Grey DeLisle], though Cheech Marin does a little scene stealing voicing a rat con artist who works with a dim iguana. While the film is mostly light and frothy – darkening only for brief periods [and kids love a good scare, so it’s not an issue] – it is not unintelligent. The characters are well [and sometimes cleverly] drawn and the relationships that form along the way feel very natural. Off course, we’re taking about a talking animals film [though the animals are only understood by each other], and no one does them better than Disney. The CG work that makes the animals appear to be speaking is very good, and the practical effects are right up there, as well. Beverly Hills Chihuahua may not quite be inspired, but it is definitely good fun – good enough to not embarrass the parents whose kids drag them along to see it.